Cash Shop Update for January 3 | Dexless, Maplestory Guides and More! January 3 to January 30 in the Special Promotions > New Arrivals category in both Reboot and non-Reboot worlds. White Time, Time Getup (M), Black Time, Time Cantabile (F), Eternal Clockwork, Mr. Time Shoes (M), Ms. Time Shoes (F), and Master Time. January 4 (after maintenance) to January 25 (before maintenance) in the Random Rewards category in non-Reboot worlds only. The Great Gachapierrot has added lots of new items! Check out the Sky Lantern Chair, Absence Chair, and White Hare Chair. Have some wild fun with the Extreme Skateboard Chair and Snowy Mountain Cable Car Chair. Use chairs to visit the different worlds from the Afterlands. These four chairs change their look randomly to display different times of day and weather patterns! First up, the powerful Land of Warriors Diorama Chair. Get icy with the Bone Fish On Ice Chair, Orange Mushroom On Ice Chair, Ribbon Pig On Ice Chair, and Hibernation! The weather is frightful! Try to stay warm on the Battling Snow Chair, Cocoa Sheep Chair, Fun Cloud Chair, and Rainy Fox Chair. Spend some time in the garden with the Lotus Leaf Chair, Secret Flower Garden Chair, Henesys Camouflage Chair, and Pantheon Camouflage Chair. Make a new animal friend with the Slimy Scene Chair, Chick Keeper Chair, Cat Bench, and Chicken Dream Chair. What does your future hold? See for yourself with the Butterfly Love Flower Chair, Crystal Ball Chair, and Pimp Chair. Have fun with the Chickie Wrap Chair, Pile of Cheese, and Regal Baby Stroller Chair. Take a ride with the Cat Cushion Mount, Ice Dragon Mount, Helicopter Mount, and Panda Mount. These mounts are available as permanent versions. Get ready for a winter wonderland with the Cygnus Snowfield Mount, Neinheart Snowfield Mount, White Mage Snowfield Mount, Hilla Snowfield Mount, and Orchid Snowfield Mount. These mounts are all available as permanent versions. Take home a familiar to join you on adventures! Check out the new Dorothy, Dorothy's Illusion, Mage Lil' Murgoth, Bowman Lil' Murgoth, Thief Lil' Murgoth, and Pirate Lil' Murgoth familiars. Familiars from Chu Chu Island are also available. Look for the Patriarch Birdshark, Unripe Wolfruit, Ewenana, and Crilia familiars are ready to join you on your adventures. And take home these familiars from Lachelein: The Paper Bag Alley Citizen, Gallina, Dreamkeeper, Red-eyed Gargoyle, and Dreaming Lucid familiars are also available. New mounts have also come to Andersen's Box! Get the Cat Cushion Mount, Ice Dragon Mount, Cygnus Snowfield Mount, Neinheart Snowfield Mount, White Mage Snowfield Mount, Hilla Snowfield Mount, and Orchid Snowfield Mount. These mounts are all available as 90-day versions. January 3 to January 9 in the Special Promotions > Limited Time category in both Reboot and non-Reboot worlds. Pick up a Chief Knight Weapon Box to get yourself a little Cygnus Knight to fight by your side! Open the Chief Knight Weapon Box to receive one of five random equip covers. January 3 to January 17 in the Special Promotions > Limited Time category in both Reboot and non-Reboot worlds. To commemorate Zero’s re-release, pick up a package containing a permanent outfit for Zero! You also receive an Astral Bolt that can be equipped over all weapons and gives you flashy effects. The packages also come with the Rhinne Luster, jewelry blessed by Rhinne, which makes you float in the air. Twelve Days of Beauty continues on January 3 with a special deal on 90-Day Facial Expressions! Assign to a hotkey to watch your character display to the world how you really feel! You have until 11:59 PM Pacific on January 3 (2:59 AM EST / 8:59 AM CET / 6:59 PM AEDT on January 4) to purchase these items at a discount! Twelve Days of Beauty continues on January 4 with a special deal on Eye Colors! Change up your eye color to get a new look! You have until 11:59 PM Pacific on January 4 (2:59 AM EST / 8:59 AM CET / 6:59 PM AEDT on January 5) to purchase these items at a discount! Twelve Days of Beauty concludes on January 5 with a special deal on Mix Dye Coupons and Mystery Mix Dye Coupons! 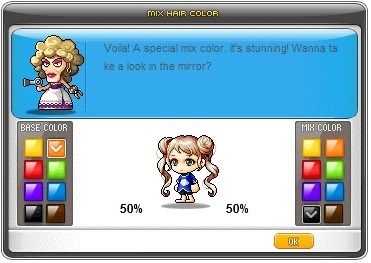 The Mix Dye Coupons work by mixing one of eight base colors with one of eight mix colors to create a unique hue. You have until 11:59 PM Pacific on January 5 (2:59 AM EST / 8:59 AM CET / 6:59 PM AEDT on January 6) to purchase these items at a discount!